AMC Classic Theater in Midtown is a 16 screen economy movie theater offering first-run national movie titles at various times seven days a week. Open seven days a week, including holidays. Check showtimes for opening hours of first feature. AMC Theaters is a national chain of popular movie theaters. The Wilmington AMC Theater (formerly a Carmike Cinema) is an AMC Classic theater and features most all of the popular and blockbuster first-run movies, from comedies, thrillers and horror flicks to occasional high definition concert films at economical prices. 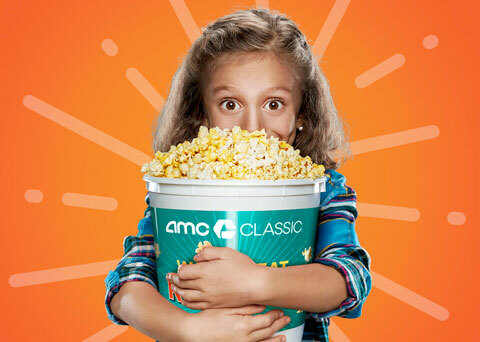 AMC Classic Annual Popcorn Bucket is one Big Deal! *Prices are subject to tax, limited time offer while supplies last, non-alcoholic drinks only. Extra, Extra – Read all about it! 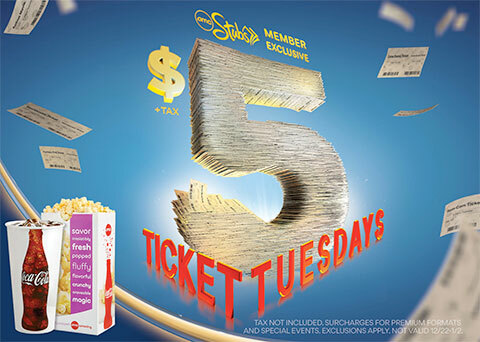 Every Tuesday take advantage of special concession deals and $5 Movie Tickets all day! Come in on Tuesdays to enjoy $2 Popcorn, $2 Drink, $2.50 Candy, and $5 off one of our fantastic concession combos (Large/Large Combo, Couples Medium Combo, Couples Large Combo, or our Nachos Combo). Get tremendous savings at AMC Classic every Tuesday. Become a member of AMC Stubbs Movie Insider Club and enjoy your second bucket refill for FREE on same day visits, along with many other great perks other benefits! Make your AMC experience even more amazing by customizing your AMC Stubs Insider profile today. By entering your information, like your email, birthday, and preferred theater, you’ll get access to exclusive deals, specials and offers. Save money and have more fun when you join AMC Stubs for FREE and get insider deals! Get a free refill when you purchase a large popcorn, earn points towards even more rewards with every dollar you spend, and receive a free gift of popcorn for your birthday!